As Le Mans 2015 kicks off today, a new competitor in the LMP1 category is making its debut – Nissan have entered the fiery pit that has belonged to Audi for many years. With Porsche coming in last year and Toyota sparking a resurgence against the dominant four rings, endurance racing has never been more popular in its entire history towards the front end of the grid. Nissan’s challenger – the GT-R LM NISMO – is nothing short of the word different. It completely turns the philosophy of the modern high end endurance racer on its head, but Nissan are confident that in the future this will be a competitive design. The GT-R LM NISMO’s engine is a longitudinal front mounted 3 litre twin turbo V6, its power delivered to the front wheels via a 5-speed Xtrac sequential gearbox. The car also incorporates an epicyclic gear cluster to finetune final drive, much like you would find in an automatic transmission. Considering that there is a new fuel flow limit for this year’s World Endurance Championship, its power output of 500hp is pretty good. As per the regulations, the Nissan is also equipped with hybrid technology in the form of two Torotrak flywheel energy stores, linked to a pair of motor generator units (MGUs – see more on these here) on each front wheel. These have an additional 750hp available so the total potential power output is a staggering 1,250hp. The flywheel energy stores are also capable of sending energy to the rear wheels via two MGUs located inside each rear hub, which at times can make the Nissan an all-wheel-drive weapon. However it is unlikely they will run energy rearwards for this weekend as they have encountered some reliability issues in recent testing. All of the car’s radiators are packaged tightly around the powertrain. Why use a front mounted engine? It doesn’t matter where in motorsport you look, in one way or another aerodynamics rule performance. There are a number of factors alongside aero that contribute to a fast car (including weight, tyres and engine performance) but the aforementioned is the greatest of all performance differentiators. It is for this reason that Nissan has opted to buck the trend of the mid-engined, rear-wheel-drive car and boldly step where nobody else has. An inherent problem with a current LMP1 mid-engined car is that they produce quite a bit more downforce at the rear than at the front. This is because the diffuser and rear wing dominate the aero work load on the car, whilst only the splitter and dive planes function as good downforce generators at the front end. By placing the engine at the front longitudinally, you create more space at both the rear and down the sides of the car which can give you some development freedom to create more downforce. The engine at the front is mounted nice and high to clear the way for these two huge tunnels. They’re so big you can literally send a small child down them – one of the Nissan mechanics did! Air is passed from two openings in the front eitherside of the engine’s main air intake all the way down the car along the sidepods, exiting above the diffuser. 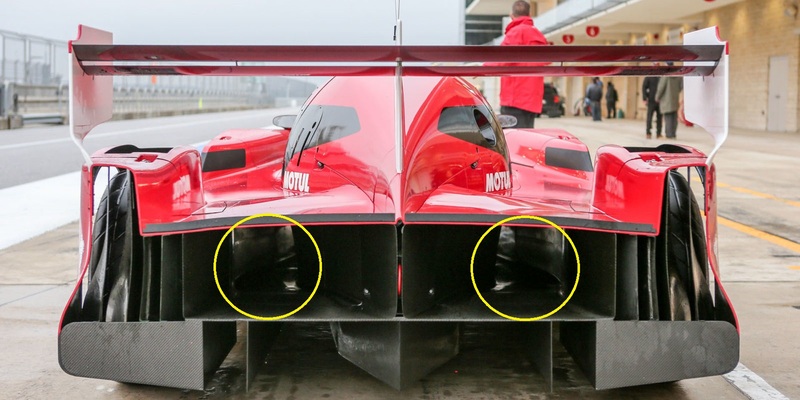 At speed the diffuser is also working hard so it also pulls air out from underneath the car, it is also pulling air through the tunnels from the front. As a result air is accelerated at the front end, which also drives airflow through the splitter just beneath the entrance to the tunnels. This subsequently produces more front downforce than their competitors, whilst still retaining good rear downforce from both the rear wing and diffuser, too. This is a highly efficient way of producing downforce, rather than adding draggy aero devices such as diveplanes and turning vanes, do top speed is virtually unharmed. Also aiding aerodynamic performance is the placement of the exhausts, which exit immediately after the turbochargers over the ‘bonnet’ of the car. This has been done to prevent the exhaust gases disturbing the air at the rear of the car where the tunnels exit, by passing the gases over the top surface around the cockpit and away from more sensitive areas. Having the engine at the front means that any shafts and gearing heading in towards the rear would result in a weight penalty, so the team chose to stick to front wheel drive. This is very much contrary to popular racecar design, which are pretty much all rear-wheel or four-wheel-drive depending on regulations. The general problem with front wheel drive is understeer – the front wheels are rotating at roughly the same rate which, although this can be controlled by a differential, often pushes the front away from the apex of the corner. Under acceleration, however, front driven wheels are actually quite advantageous as – with the weight of the car over the front – traction is better. With more weight over the front end and more front downforce, the idea is that both traction and front end grip are sufficient enough to counter any of that understeer that plagues front-wheel-drive cars. However torque steer could also cause some problems, creating an unpredictable car when one side is under more load than the other. Another reason why Nissan rejected rear-wheel-drive is because of the tunnels that run along the car. Half shafts would have had to be placed right across the tunnel, interrupting airflow and causing turbulence. Cleverly, Nissan have also considered how the car can recover energy under braking for its hybrid system. Generally more work is done on the front brakes of the car as its mass tips forward under braking. As the car is front-wheel-driven by both the combustion engine and two MGUs, more energy can be harvested during the braking phase than it could if the MGUs were just at the rear wheels. All three LM NISMO’s qualified outside the 107% time of the pole position Porsche 919 Hybrid, but the car isn’t miles off the pace – they were still quicker than the leading LMP2 car. Whilst their hybrid system is capable of 750hp on its own (which would put them in the 8MJ class), the team have had trouble making the it run reliably for long periods of time so they have instead dropped to the 2MJ class for Le Mans. This costs them dearly on the straights, whilst the aerodynamics of the car are also sub-par despite the bold claims Nissan are making. Overall then,its debut hasn’t been glittering, but there is some potential in the concept. Once the hybrid system is fully operational Nissan can do some solid work on making their ambitious aero platform work well and maybe, just maybe, take the fight to the establishment. 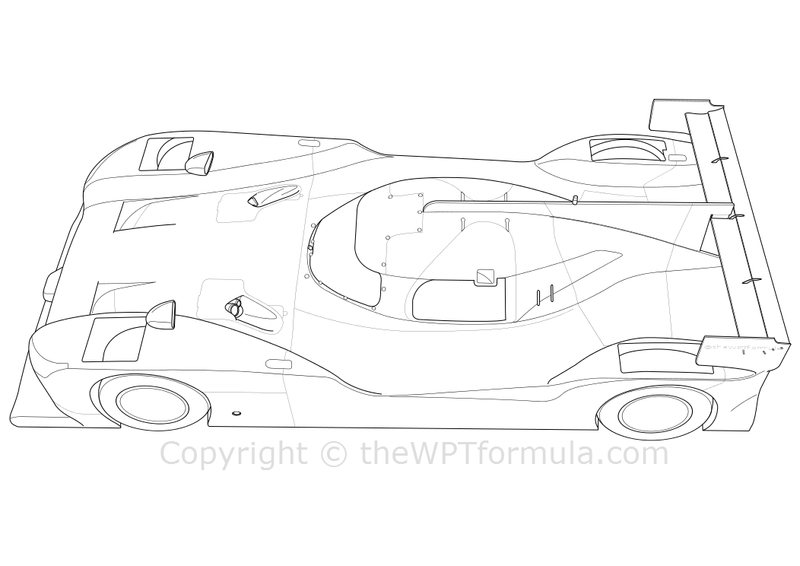 This entry was posted in Analysis, Special/Other and tagged 2015, 24 hours, analysis, gt-r, gtr, le mans, lm, lmp1, nismo, nissan, specifications, technical on June 13, 2015 by thewptformula. Wasn’t the main problem with recovering that much kinetic energy with a front wheel drive ? Ok, it’s easy to recover a maximum of this energy with such a beefy front train, since the front wheels are where you break the most. Does the problem appear when you have to put that energy back here ? Probably not, since the maximum strain the engine and motors puts on the front train is lower than that of the brakes. But it last longer and above all, comes in addition to that of braking. So, this must have put a lot of wear on the ‘poor’ front tyres. And worst, a lot of heat, with the tyres not having any time left to cool down. Nissan would have therefore put some motors on the rear train … with additional weight, and only partially solving the front tyres issue. That’s my guess. The fact that Nissan ran in the 2 MJ class seems coherent with it. They could even have entirely dropped (removed ?) the front MGU-K’s and only work with the rear ones.